are a new series of 2k events to encourage children from 4-14yrs old to get the habit of running in a fun, friendly and safe environment. They are free to enter, for all abilities, and organised by local volunteers. Each child needs to be registered and have a personal barcode. Most of their events are weekly, but they still have four events which run monthly which it is hoped will change at some point. 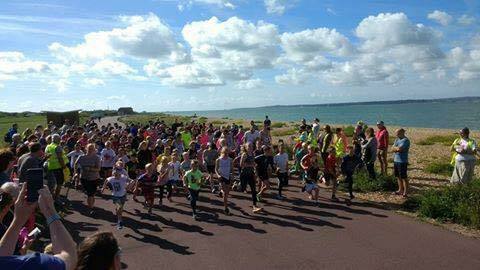 The Stokes Bay Junior Park Run takes place on Sunday mornings at 9am for 4-14 year old only. Youngsters need to be registered with parkrun UK and have a barcode. They meet at Stokes Bay Promenade, Pebble Beach, Stokes Bay Road, Gosport, PO12 2BL. from where they walk onto the promenade for the run. The course is at Stokes Bay Promenade, Gosport. The course is 2000m (2K) long. This has been accurately measured by ParkRun with a professional measuring wheel. The course is run entirely on concrete paths. Some sections of the course may accumulate mud, leaves and puddles after rain. Marshals will be located along the course. The flat tarmac course is one lap on Stokes Bay promenade. It starts 150 metres south-east of Pebbles Cafe, and heads north-west past the café before turning at a cone by the promenade barrier. Keep to the LEFT and turn clockwise around the cone. Head south-east past the start until the 2nd turning cone just before the lifeboat station (GaFirs). Again, keep to the LEFT and turn clockwise around the cone. Then head back past the start and continue to the finish, just past the Sailing Club. It’s free, Kids just turn up and run. Even little tackers. Adults can run with nervous youngsters. Visit the Park Run UK Website to register for running.